Posted on May 27, 2013	by Picture This Great Teaching	in Middle School, University of California Los Angeles Center X	with Comments Off on Martha I. When I picture great teaching I see students smiling and enjoying learning. Students in my Medieval History class are examining Martin Luther’s 95 Theses. They are tackling the primary source document, taking turns being Martin Luther, and are being questioned by “reporters” in the rear of the class. All of this is overseen by the Pope, who serves as a referee. The board on the back includes images to illustrate key ideas from the Reformation. I believe this picture incorporates key strategies that lead to great teaching and learning, such as performances, visuals, access to high level material, art, and participation by all students. 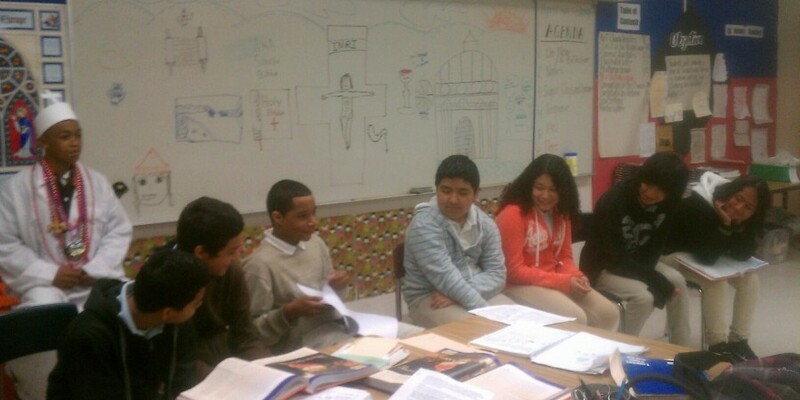 As can be seen by the faces of my students, they thoroughly enjoy and approve of this way of learning. It stays with them.